If you’re looking for a delicious way to jazz up your weekly work lunch menu then this is a recipe for you. 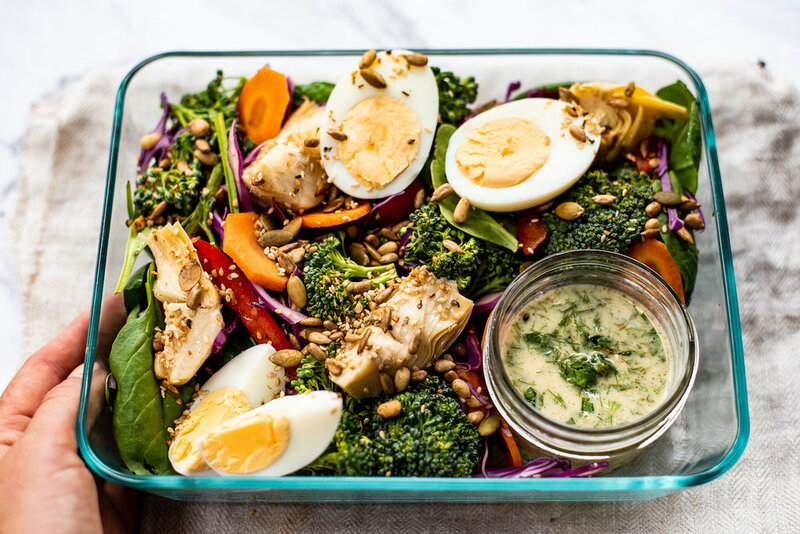 It’s an easy recipe to pull together and once you have the dressing you can mix up the salad components to suit what you feel like (or what needs to be used from the fridge!). Mix all ingredients in a shaker and shake. Season to taste. This is similar to a French Dressing - use in leafy green salads. Add a Tsp of Mirin or Sake for extra flavour. In a large bowl or container, mix the cooled roast pumpkin with the spinach, broccoli, sliced red cabbage, carrot, red capsicum and artichoke hearts. Add the boiled eggs, then scatter the seeds, diced avocado and coriander leaves on top. Make your dressing and put it in a small screw-top jar if you’re taking it to work, so you can dress your salad at lunchtime.